2019 will mark the 100th anniversary of Hamilton Golf & Country Club hosting its first National Men's Open Golf Championship. Since that time the club has hosted the Canadian Open on five other occassions, most recently in 2012, and as part of its agreement with Golf Canada and RBC, the Open will return to HGCC in 2023. The first Canadian Open at HGCC took place in 1919 - it was a championship that featured two of the most legendary names in golf - Bobby Jones and Francis Ouimet, but it was J. Douglas Edgar who would go on to earn a 16-stroke win. Please note that tickets are not available for sale at the club. 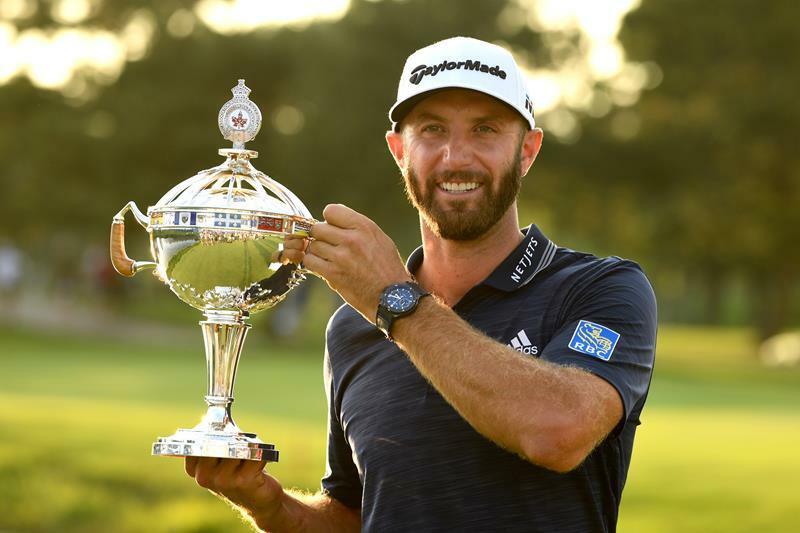 General admission tickets, starting at just $25 for early week access, provide access to the grounds to get an up-close look at the stars of the PGA TOUR including defending champion and Team RBC member Dustin Johnson and No. 4 Rory McIlroy. Tournament rounds for Thursday $70, Friday and Saturday $75; a Sunday final-round ticket is $80; and a weeklong, fully-transferable badge is $160. As well, Tuesday admission for RBC Hall of Fame Day is complimentary with the purchase of a Thursday, Friday, Saturday or Sunday ticket. A specially-priced youth ticket (13-17 years old) is also available while juniors aged 12-and-under gain FREE grounds admission all week long. The City of Hamilton in conjunction with Golf Canada will be working closely with area residents and businesses to inform everyone about Road Closures and Parking Restrictions during the RBC Canadian Open. On March 21 RBC and Golf Canada announced that world ranked No. 4 – Rory McIlroy – will compete in the 2019 RBC Canadian Open, June 3-9 at the Hamilton Golf and Country Club. Fresh off an impressive victory at the 2019 PLAYERS Championship, McIlroy joins an already strong field of players, including world No. 1 and Team RBC Ambassador Dustin Johnson, alongside team members Jim Furyk, Adam Hadwin, Webb Simpson and Brandt Snedeker. McIlroy’s commitment to play in his first RBC Canadian Open builds on an earlier announcement this week introducing a two-night RBCxMusic Concert Series at the tournament. The concerts will feature Grammy nominated and internationally acclaimed duo Florida Georgia Line on Friday, June 7, and JUNO award-winning homegrown rock band The Glorious Sons on Saturday, June 8. In the coming weeks, additional players, including Canadians and tournament exemptions, will be announced. PGA TOUR players have until Friday, May 31 to commit to the field of the 2019 RBC Canadian Open. More information about the 2019 RBC Canadian Open including tickets, corporate hospitality and volunteer information is available at www.rbccanadianopen.com. HAMILTON, March 19, 2019 — RBCxMusic, in partnership with Golf Canada, is pleased to announce a new concert series, featuring Grammy-nominated and internationally acclaimed duo, Florida Georgia Line (FGL), and JUNO award winners and homegrown rock band, The Glorious Sons, taking place at the 2019 RBC Canadian Open. The concert series will be held on the iconic grounds of the Hamilton Golf and Country Club on June 7 and 8, 2019, and will offer an enhanced experience for golf fans, music lovers and players alike. Global entertainers Florida Georgia Line are well known for their innovative artistry and chart-topping songs – including their 16th #1 hit “Simple” and breakout 11X-PLATINUM smash “Cruise.” Their fourth studio album CAN’T SAY I AIN’T COUNTRY (BMLG Records) recently arrived, racking up over 473,000 album consumption globally to date, and debuting at #1 on the Billboard Top Country Albums chart. The project features current chart-rising single “Talk You Out of It.” The pair will launch their North American 2019 CAN’T SAY I AIN’T COUNTRY TOUR this summer. Canadians will have the opportunity to see FGL live in concert at the RBC Canadian Open on June 7, 2019 – their only Canadian stop this year. In addition, The Glorious Sons, hailing from Kingston, ON, will be performing on Saturday June 8th, 2019 at the concert series. The band have ten consecutive top-10 songs on Canadian Rock radio including the Gold-certified single “Everything Is Alright", and recently enjoyed four weeks at #1 on the U.S. rock charts with their hit single “S.O.S. (Sawed Off Shotgun)”. They are currently on their headline “S.O.S. Tour” in the United States, which has included sell-out performances in Philadelphia, Detroit, Minneapolis, Chicago, Denver and Buffalo." Tickets are all-inclusive: your tournament day pass is your concert ticket. The RBC Canadian Open’s return to the historic Harry Colt designed course in 2019 is timed perfectly – marking the 100-year anniversary since the renowned club originally first hosted the Open. This year will be the sixth time the Hamilton Golf and Country Club has played host to Canada’s National Open Championship (1919, 1930, 2003, 2006 and 2012). In addition to the concert series, the tournament will feature new spectator enhancements, including a local foodie and patio experience, junior initiatives, the RBC Hall of Fame Day celebration and the return of The Rink, awarded 2018 best-in-class element by the PGA TOUR. HOW: Tickets on sale Friday, March 22 at 10:00 a.m.
Tickets will be available for purchase at RBCCanadianOpen.com. Tickets are $75 (plus taxes and service charges). The event is General Admission / All Ages. Your tournament day pass is your concert ticket. Volunteer sign-up is now open through the Golf Canada website. CLICK HERE for the link to the RBC Canadian Open registration page and follow the instructions. The following are links to recent articles and features relating to HGCC and the 2019 RBC Canadian Open. Globe and Mail reports on Rory McIlroy to play in 2019 RBC Canadian Open - CLICK HERE - March 2019. Golf Channel covers Rory McIlroy announcement to play in RBC Canadian Open - CLICK HERE - March 2019. Toronto Sun story about the RBCxMusic Concert Series CLICK HERE - March 2019. Read Scott Radley's story in the Hamilton Spectator about the RBCxMusic Concert Series and Florida Georgia Line - CLICK HERE - March 2019. Please CLICK ON the links below for information about HGCC and the Canadian Open. Golflinks Road, south side, east of the service entrance opposite Golfdale Place. This is just east of the main spectator entrance to the tournament. Please note that the bus stops at Bay and Caroline in both directions were added to service the hotels in the vicinity. Additional service will be added in the evening in order to get spectators back downtown after the completion of the concert. Please note that the shuttle service will not be available from Monday to Wednesday for the practice and Pro-Am rounds. On these dates, spectators will need to take the 5A/5C buses destined to/from the Ancaster Meadowlands. The 5A/5C buses will take customers to the intersection of Golflinks and McNiven. A walk of about 10 minutes westerly along Golflinks Road would be required to get to the main spectator entrance opposite Golfdale Place. For more information, schedules and notices, please visit www.hamilton.ca/hsr-bus-schedules-fares/schedule-routes-maps. Set on incredible rolling land that has few rivals in terms of varied topography, HGCC’s original 18 is a testament to what a timeless golf course can be. Designed by Harry Shapland Colt, the famed British architect behind courses like Royal Portrush and Muirfield, Hamilton has been considered one of the best parkland courses in North America for more than a century, and played host to the best golfers in the world. The West Course makes up the front nine of the Championship Course for the RBC Canadian Open followed by the South Course for the back nine. The East Course is not part of the Canadian Open layout. WEST COURSE – The course Colt designed is full of brilliant moments that utilize the property in remarkable ways. The West course includes the original front nine. Holes like the third, run through magnificent valleys, while other holes play over areas where the land dips, like the sixth and eighth holes, two of the best par threes in golf. SOUTH COURSE – HGCC is walked by the vast majority of members. On the South course, we find Colt’s finishing holes as the routing concludes with an iconic par-4. The magnificent green is set into a natural amphitheatre with the classic clubhouse perched on top of the hill. EAST COURSE - In 1928, the club, acting on advice from Colt's design partner, Charles Alison, purchased 119 acres adjacent to the existing golf course. In 1973, C.E. "Robbie" Robinson designed nine new holes on the land that was purchased nearly 50 years previously. "If you have the money to spend there is no reason why you should not have one of the finest golf courses in America," Harry Shapland Colt wrote to the club prior to his visit in May 1914.